Allan Sekula’s triptych is a significant early example of burgeoning conceptual approaches to photography at the beginning of the 1970s. It is the first work in which this highly influential artist and writer incorporated a critical text as an integral part of the overall artwork. 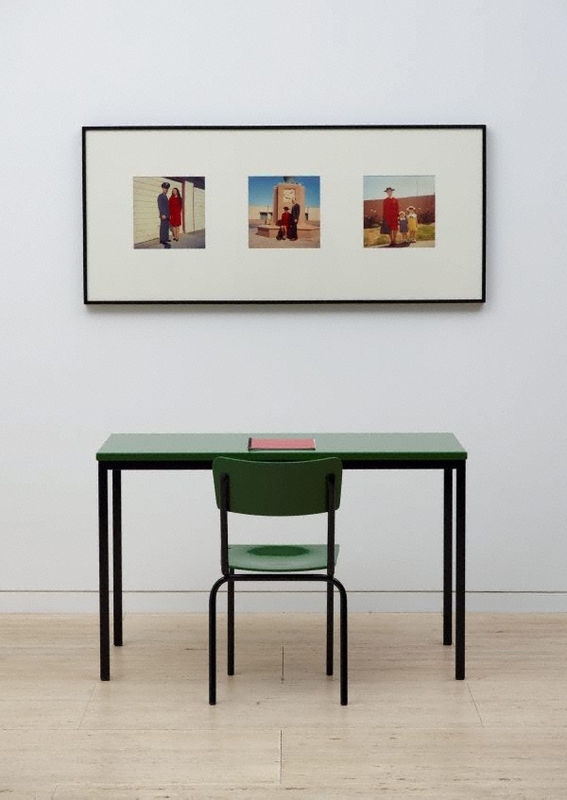 ‘Meditations on a triptych’ is composed of enlarged snapshots, installed over a simple metal green-painted reading desk and chair. 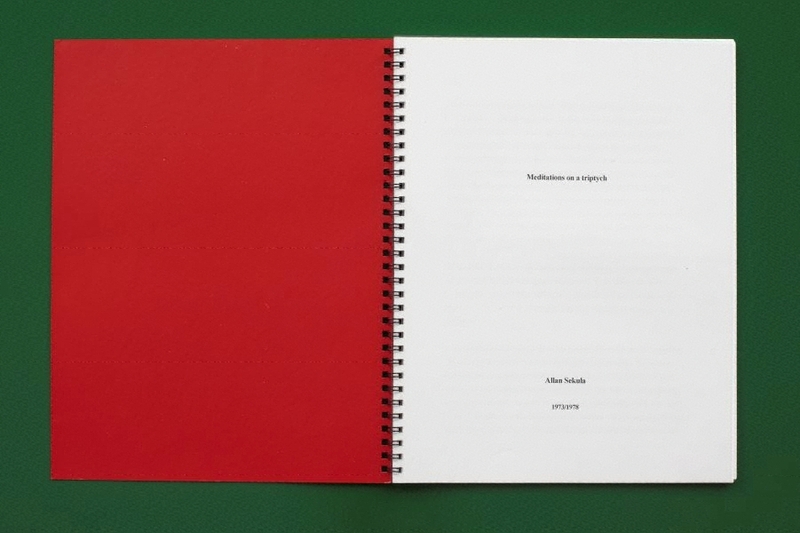 The red spiral-bound book on the table contains Sekula’s typewritten essay. Written and re-written between 1973 and 78, the text speculates on the possible meanings of the photographs and their relationship to each other. The underlying agenda of ‘Meditations…’ is simple yet provocative: Sekula invites the audience to contemplate and consider three vernacular photographs just as they would a Renaissance triptych. The images of a woman in three different stages of her life hint at a critical commentary on the social condition of women. Yet it is only by sitting down at the table and reading the text that the political, cultural and historical dimension of these ostensibly ordinary images becomes fully apparent. Veering between fact and imagination, Sekula’s essay is a bravura demonstration that photographs deserve a sustained and in-depth reflection. We do not learn from the work itself that the characters in the photographs are Sekula’s family. Or that the two pictures on the left were taken when the artist was an adolescent.1 Sekula withholds vital information in order to ask pertinent questions about the nature of the medium. What do photographs actually reveal? Does their tenuous connection to facts undermine their validity? For Sekula, the use of writing and critical text has always been imperative: ‘because of the limited representational range of the camera one cannot photograph ideology but one can make a photograph step back and say look, in that photograph there is ideology…’2. Proof: Los Angeles art and the photograph 1960-1980 , 1992, 90-91.